Tomb Raider (film, 2018). A 2018 action-adventure film with "PG-13" rating by Warner Bros. Pictures/Forum Film Poland. Directed by Roar Uthaug. Official Trailer. Tomb Raider is a 2018 action-adventure film directed by Roar Uthaug. 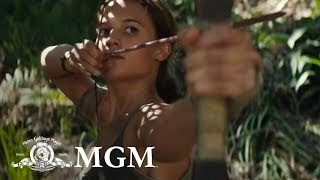 TOMB RAIDER | Official Trailer #2 🎥🎞 | MGM. Following the disappearance of her father, Lord Richard Croft, Lara Croft makes a living as a bike courier. When she is arrested after a bike accident involving a police car, Richard's business partner Ana Miller posts her bail. After never claiming her inheritance for many years, believing her father to still be alive, Miller warns Lara that if she does not claim her vast inheritance, her father's country estate, Croft Manor, will be sold off. Lara reluctantly accepts and gains access to a secret chamber in her father's tomb. There she finds a pre-recorded video message from Richard detailing his research into Himiko, the mythical Queen of Yamatai who was said to command the power over life and death. Richard warns Lara to destroy all of his research, but she ignores his warnings so that she can investigate further. Lara travels to Hong Kong where she hires Lu Ren, captain of the ship Endurance, to sail into the Devil's Sea and the island of Yamatai. The ship capsizes in a violent storm and Lara is washed ashore where she is knocked unconscious. She awakens only to encounter Mathias Vogel, the leader of an expedition to locate Himiko's tomb. The expedition has been funded by a shadowy organization called Trinity, which seeks to harness and weaponize Himiko's power. Vogel takes Lara prisoner, claiming that he killed her father and revealing that he intends to use Richard's research to continue his expedition. He adds Lara and Lu Ren to his slave force; eventually, the two of them try to escape, and Lara is the only one successful. Principal photography began on January 23, 2017, in Cape Town, South Africa, and ended on June 9, 2017, at Warner Bros. 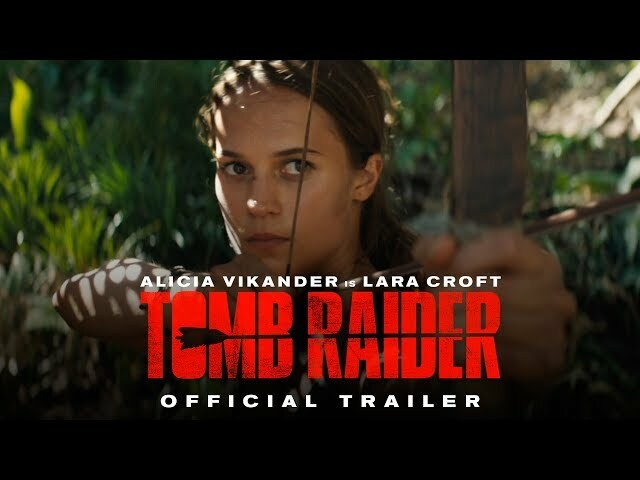 The film Tomb Raider was scheduled to be released by Warner Bros. Pictures and Forum Film Poland on March 2, 2018 (Berlin), on March 7, 2018 (Indonesia), on March 8, 2018 (South Korea, Philippines, Singapore), on March 9, 2018 (India), on March 14, 2018 (United Kingdom, France), on March 15, 2018 (Argentina, Australia, Brazil, Colombia, Czech Republic, Germany, Denmark, Greece, Hong Kong, Croatia, Hungary, Italy, Malaysia, Netherlands, New Zealand, Portugal, Serbia, Russia, Thailand, Ukraine), on March 16, 2018 (United States, Sweden, Bulgaria, People's Republic of China, Estonia, Spain, Finland, Lithuania, Mexico, Norway, Pakistan, Romania, Turkey, Taiwan, Vietnam, South Africa), on March 21, 2018 (Japan) and on April 5, 2018 (Poland). The duration of the film is 118 minutes. With a budget of $90 - 106 million, the film grossed over $274.7 million. Tomb Raider got average rating from critics. But the audience likes the film. Audiences polled by CinemaScore gave the film an average grade of "B" on a scale ranging from A+ to F.